As chief engineer of English Electric's Aircraft Division it was W.E.W. (Teddy) Petter's responsibility to keep looking at new projects. Towards the end of 1946 he spent some time sketching possible configurations for a supersonic aeroplane. It was characterised by sharply swept wings and tailplane and a long slab-sided body with two engines one above the other. He had discussions with officials at the Ministry of Supply early in 1947, and was rewarded in May of that year by a study contract for an aircraft to meet a supersonic specification, ER.103 (ER= experimental research). The officials suggested Mach 1.5, equivalent at 36,000ft to about 860 kt. The Air Staff agreed to write a specification for an aeroplane "to investigate the practicality of supersonic speed for military aircraft", designed to have fighter-like handling characteristics, to be built to fighter strength factors (7g) and to carry guns and a sighting system. The specification was F.23/49. It was not put out to general tender; instead English Electric were awarded a contract for two flight prototypes and a static-test airframe. They called the aircraft the P.1 (project 1). It followed Petter's long earlier refinement of the classic configuration he had conceived, with the single notable change that he put the tailplane very low on the rear fuselage instead of on top of the fin. He chose to use a pair of simple Armstrong Siddeley Sapphire turbojets, with plain fixed nozzles and no reheat, and fed by a plain inlet in the nose. This was in keeping with his “simple, off-the-shelf” philosophy. To minimise frontal area he staggered the engines, bringing the lower one well forward with a long jet pipe. After a lot of study he adhered to his original plan to have a mid wing, with the engine air ducts passing above and below it. The form of the wing was crucial, and unique, notable features being the fact that the 60 deg sweep halved the apparent ratio of thickness to chord and allowed it to have a generous radius on the leading edge, and the ailerons joined the leading and trailing edges in a novel way. Petter left the body free of fuel and marked out part of the main torsion box of the wing to serve as an integral tank. He devoted a large bay to the rear of the torsion box to house the main gears in an unusual installation with doors hinged on the inboard side of the wheel well, even though the legs retracted outwards. The legs had to be long, because it was clear that the P.1 would takeoff and land at a marked nose-up angle. Owing to the thin wing the wheels had to be of large diameter and have tyres inflated to high pressure (no less than 280 lb/sq in). To minimise drag the canopy was made flush with the top of the fuselage, though a flat windscreen was provided for the gunsight. The nosewheel folded forwards and turned to lie flat under the inlet duct. All controls were fully powered, the horizontal tail being of the new "slab" type, and there were sharply swept split flaps. Petter was careful not only to stress the P.1 for 7g but also to make weight provision for a military payload. So advanced was the design - and so complex the aerodynamic problems which this design posed - that Britain's first transonic wind tunnel was built to facilitate testing. Short Brothers at Belfast were instructed by the Ministry of Supply (MoS) to build a research aircraft able to investigate aspects of Petter's design which the MoS considered more revolutionary than functional. Thus Short's S.B.5 had a wing which could investigate sweepback at 50 degrees, 60degrees and 69degrees, landing gear which could be adjusted to cater for the CG changes in these different configurations and, at a later stage, a low-set tailplane. When both wind tunnel testing and S.B.5 confirmed that Petter's design had been right from the outset, the MoS let English Electric get on with construction of two prototypes and a static test airframe. 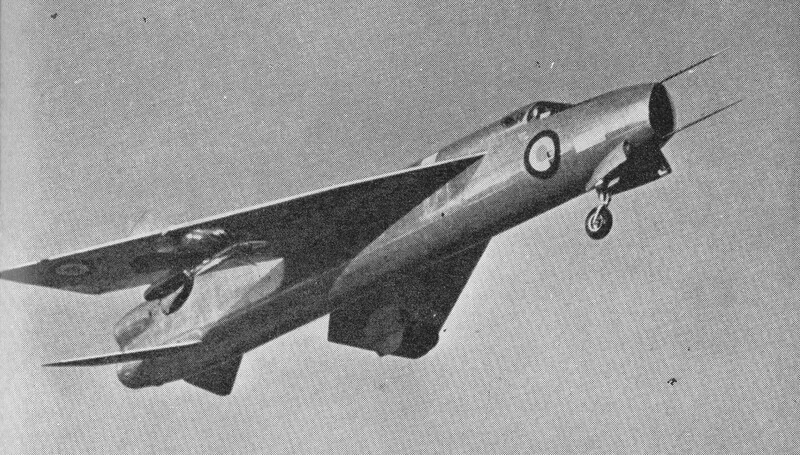 English Electric P1A, WG760, was the first of two prototypes and had its maiden flight on 4 August 1954, piloted by Roland Beamont. On its third flight the aircraft became the first British aircraft to exceed Mach 1 in level flight. On his third flight the Mach needle refused to move beyond 0.98, but subsequent analysis suggested the P.1 had gone supersonic. Later this machine, WG760, and its partner, WG763 (which had guns, and first flew on July 18, 1955), explored the flight envelope to mach 1.53, demonstrated superb handling qualities and were later given a bigger fin to ensure ample stability margins at high Mach numbers, and a neat faired-in belly tank to increase the fuel capacity above the original limit of a mere 5,000lb. The first aircraft flew with Sapphires with crude reheat and fixed-area nozzles sized to the reheat condition. The three resulting P.1B prototypes had and the first of these flew on 4 April 1957. The second flew with a revised wing with a kinked leading edge and broad tips with inset ailerons which gave better low-speed lift and longer range, as well as opening out the high-altitude buffet boundary. The first of the three hand-built P.1B prototypes first flew on 4 April 1957 with the more powerful engines mounted one above the other in the rear fuselage, with the lower engine well forward of the upper. 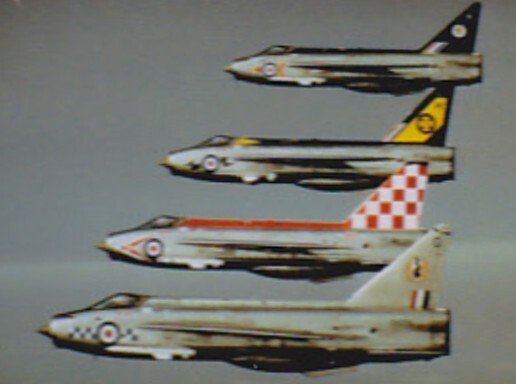 The production F.1 Lightning began to enter service with the Central Fighter Establishment at RAF Coltishall in December 1959, and after protracted development the Lightning finally entered service in May 1960 with No 74 Squadron. The third aircraft built, a P.1B, became the first British aircraft to exceed SQ.M.0 on 25 November 1958. The jet is capable of cold start to airborne in 1.5 minutes, a climb to 40,000 ft in 2.5 minutes from brakes off and a zoom climb to over 70,000 ft.
Twenty development machines had been ordered, the first of these, XG307, flying on April 3, 1958. These led, fairly smoothly into the production fighter, which in October 1958 was named Lightning F.1, and CA Release was obtained late in 1959, No 74 "Tiger" Sqn being equipped at Coltishall the following July and August. The Lightning PE1B XG337 was the last of 20 pre-production Lightnings used for armament, powerplant and radar test-ing at Farnborough. Gradually the Air Staff and ministry officials grudgingly permitted small improvements to be made. The Mk 1A introduced a crude refuelling probe fixed under the left wing (nobody would pay for a neat folding one); the Mk 2 brought in improved Avon 210 engines and numerous systems advances. 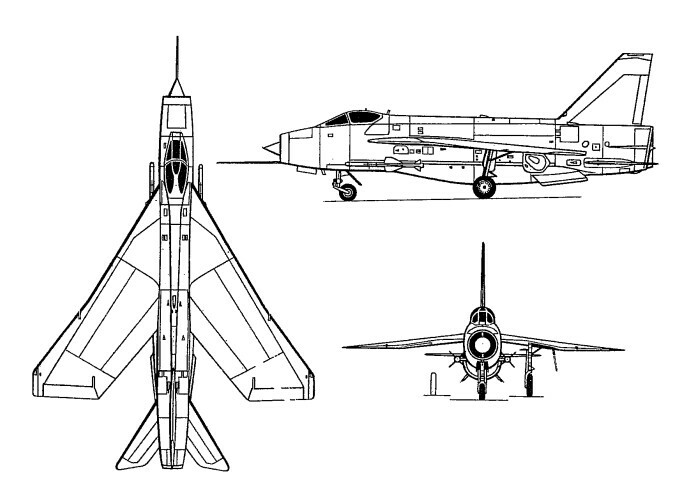 The F.3 (which entered RAF service in January 1964) was the major production version having an improved radar and collision-course Red Top missiles, as well as more powerful Avon 301 engines and other changes including a bigger square-topped fin. The T.4 was a dual control side-by-side Mk 1A; the T.5 was a dual control Mk 3; and the Mk 6 was the result of common sense finally creeping into the minds of the Air Staff. With the Mk 6 BAC, as the company had become in 1960, were allowed to fit a proper fuel system, with roughly double the capacity of the early versions. One visible manifestation of this was the area-ruled ventral bulge, housing 600gal, which could also carry twin 30mm Aden guns or other stores (the original nose guns had been left off and then later put back again) and overwing pylons for twin 260gal ferry tanks or force-ejected retarded bombs. The Mk 6 also, at last, got the improved wing. The F.6 entered service during August 1966 and remained operational until 30 June 1988. 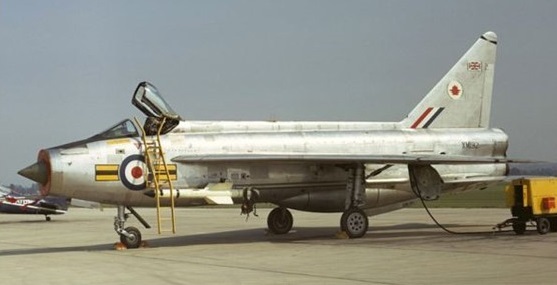 While Mk 3s were expensively modified to Mk 6 standard, in 1964 BAC were able to offer an export version (with racks for a 4,0001b load under wing), and sold F.53 and T.55 Lightnings to Saudi Arabia (which led to a further BAC assistance deal in 1972-73). Kuwait bought a smaller number. 285 were built for the RAF or development service. A total of 338 Lightnings were built by English Electric and the British Aircraft Corporation. Engines: 2 x RR Avon. Engines: 2 x Rolls/Royce Avon, 14,430 lb. Wing span: 34 ft 10 in (10.61 m). Length: 55 ft 3 in (16.84 m). Height: 19 ft 7 in (5.97 m). Wing span: 34 ft 9 in. Engines: 2 x 16,360 lb. (7,420 kg.) thrust Rolls-Royce Avon 301 turbojet. Wing span 34.8 ft (10.61m). Length (including pitot probe): 55ft 3in / 16.84m. Height: 19ft 7in / 5.97m. Wing Span: 34ft 10in / 10.61m. Wing area: 460 sq ft. / 42.7sq.m. Track: 12ft 9.5in / 3.89m. Wheelbase: 18ft 1.5in / 5.52m. Sweepback (leading edge): 60 degs. Empty wt (with gun pack and missiles): 29,600 lb / 13,426kg. Maximum Take-off wt (Fully armed Mk53): 41,700 lb / 18,914kg. Gross wt: approx. 45,000 lb / 20,412kg. TO run (at 38,500 lb / 17,464 kg: 3300 ft / 1006m. Time from brakes-release to Mach 0.9 at 40,000ft: 150sec. Time to accelerate from Mach 1 to over Mach 2: 210sec. Landing (with parachute) at 29,000 lb (13,154kg): 3,600ft / 1,097m. Landing run (at 38,000 lb / 17,237 kg: 4500 ft / 1371m. Max speed: Over Mach 2 (over 1,500 mph / 2,414km/hr). External fuel cap: 520 Imp.Gal / 2364 lt.